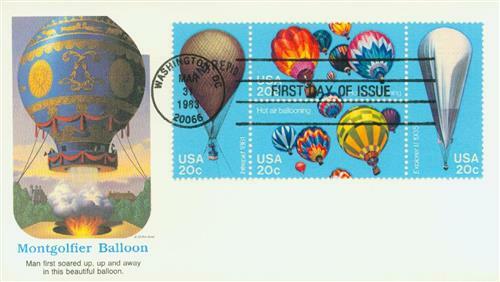 US #2032-35 were issued for the 200th anniversary of the first balloon flight. Click the image to buy. On January 9, 1793, Jean-Pierre Blanchard carried the first letter by hot air balloon in America. By 1793, Blanchard was well-known as a balloon aviator. He made the first flight across the English Channel, which was also the first time mail was ever carried by air (we shared this tale on January 7). He also made the first balloon flights in Belgium, Germany, the Netherlands, and Poland. 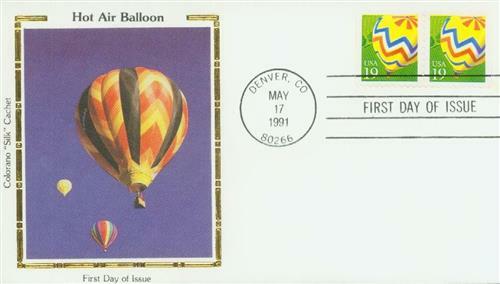 US #2530 was issued to cover the postcard rate in 1991. Click the image to buy. Blanchard arrived in Philadelphia, Pennsylvania, on December 9, 1792, excited to bring his pioneering balloon exploits to America. 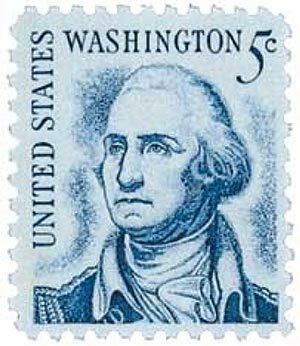 He arranged to stage a flight one month later, on January 9, which gained the attention of President George Washington. Washington would be among the crowd to witness the first balloon flight in America. On the morning of January 9, Blanchard began inflating the balloon at about 9 am. Throughout the morning cannons had fired, and as the takeoff approached a band began to play. In an attempt to cover the costs of his venture, Blanchard sold tickets for five dollars a piece. However, on the day of his trip, spectators crowded into nearby lots to watch the event for free. Then at 10 am, Blanchard prepared to leave. Just before takeoff, President Washington handed him a piece of paper and spoke a few words to him. He then climbed into the balloon’s basket and immediately took off. As he ascended, he flew both the US and French flags. The balloon then rose high and began floating southeast at about 20 miles per hour. US #2032-35 – Fleetwood First Day Cover. Click the image to buy. Once up in the air, Blanchard performed three experiments. A Doctor Glenworth had him test the strength of a magnet, Benjamin Rush had him measure his pulse, and Caspar Wistar had him capture some air in bottles. US #1283B from the Prominent Americans Series. Click the image to buy. After a 46-minute journey, Blanchard landed in Deptford, New Jersey. The property owner had seen the unusual craft descending and approached it with caution. Blanchard offered him wine and the letter from President Washington. 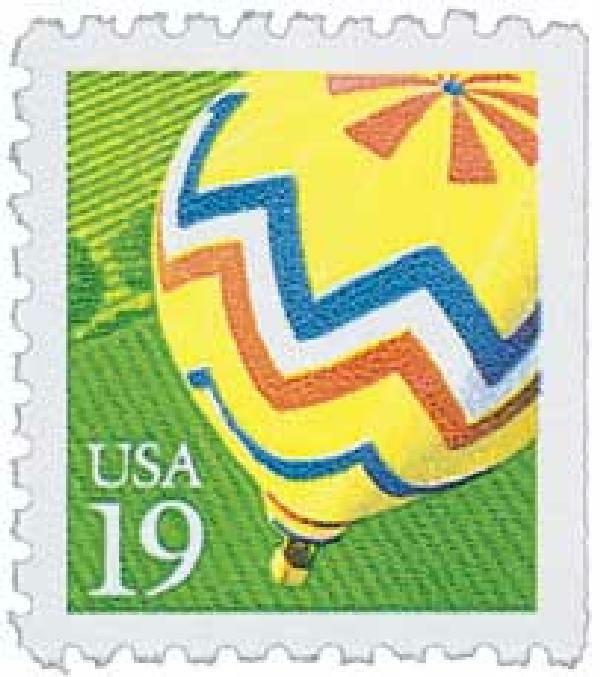 The President had instructed Blanchard to give the letter to whoever owned the property he landed on, making his balloon flight the first delivery of mail by air in America. US #2530 – Silk Cachet First Day Cover. Click the image to buy. A small group of people had arrived by the time Blanchard touched down and they read the letter aloud. Upon hearing that the letter was from the president, they all anxiously helped Blanchard make his way to a carriage so that he could return to Philadelphia to tell President Washington about his journey. 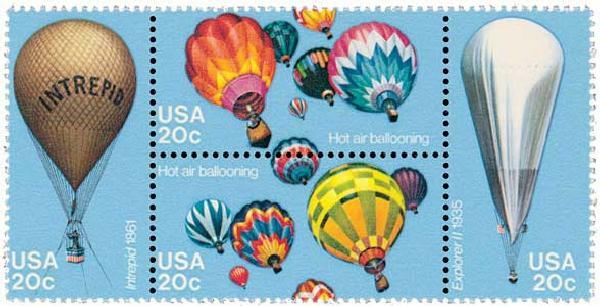 5 Responses to "This Day in History… January 9, 1793"
It’s my favorite stamp air balloons. Does anyone know the lift off location in Phila? Not know be me, very interesting. Thanks for covering another interesting topic. Does the letter from.GW still exist? Perhaps in the Smithsonian?